Freedom Studios is an intercultural theatre company that connects different communities by telling stories. • Our work is inspired by the diverse and often hidden voices of the City of Bradford. • We make new, high quality theatre productions in non-theatre spaces, for multicultural audiences, especially those who don’t normally go to the theatre. • We tell stories about different cultures meeting, which ask people to connect with others as individuals. • We work in conversation with communities to get to the heart of the story. • We nurture and support new generations of diverse artists in Yorkshire. Freedom Studios is committed to putting people at the heart of its activities especially those with limited opportunities to engage with the arts and whose voices are not often heard. Our artistic ideas come from listening to people, overhead conversations, stories from the streets, and from artists with a passion and something to say. We are driven by a restless urge to explore and reflect an ever-changing Britain and its people through engaging and listening to their stories and engaging with the social, cultural and political issues that are important to them. We support the development of diverse artists by running training programmes, which offer genuine opportunities for progression and the experience of working within a company, such as the Street Voices emerging writer’s courses. We look for exciting new voices that tell contemporary stories that are both provocative and entertaining. All our productions are commissioned new work – original, adventurous and culturally enriching. Our work has enabled young performers to forge careers in television and the theatre, emerging writers to gain commissions; and local people to take part in theatre events. The critically acclaimed national touring production Home Sweet Home by Emma Adams, was set in an imaginary old people’s home, and had a community chorus of eight older people from Bradford, Stockton and London and community choirs from each of these locations too. We work collaboratively in strategic partnerships to extend our reach and impact and to create more opportunities for people to benefit from arts engagement and activity to bring about change in their lives. In realising our work we seek to find authentic and extraordinary processes of collaboration, participation and interaction between performers and the audience. 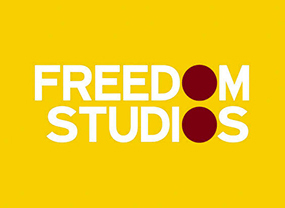 Continuing as an ACE NPO from 2015 to 2018 will see Freedom Studios expand into new areas of activity, new arenas and new artistic development to ensure that the company thrives in the future.